Getting back on eBay after a suspension has never been easier! eBay Stealth – Suspended Account on eBay? Need a new eBay Account? We can help! Stop worrying about when eBay or Paypal will close your account. Our system is fool proof and can be done numerous times! 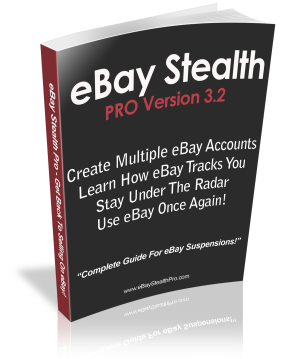 If your eBay account has been suspended and they won’t allow you to create any more accounts, then eBay Stealth is for you! I know how it must feel if you’ve been suspended from eBay, your entire business could be ruined, and you could be left with no money to pay off your bills or even to support your family. It can be heartbreaking and leave you no choice but to find another job. I’m here to tell you that you don’t have to find another job, but you can easily continue selling on eBay if you create a stealth account with us! What exactly is a eBay stealth account? Well its quite simple, it is an account that you use, but it will not be linked at all to your banned account or to your current computer. eBay has advanced tracking techniques to make sure that you never ever be able to create a new account, however, we have them all down and can easily get passed them! Don’t be left out and cost your business money that you could be easily making selling your goods on eBay! Getting eBay stealth today will guarantee you a brand new, ready to sell account in only a few simple to follow guide lines in our eBook! After your purchase, you will received the complete eBook and you can get started right away to creating your fully anonymous account! The eBook outlines in full detail each step by step that you need to take to insure that you create your fully anonymous account. The techniques described are completely LEGAL and SAFE to use over and over again. You may use our steps in the eBook as many times as you’d like to create multiple untraceable accounts. This way, you will always have your bases covered in case you fall in the same suspension that closed your account the first time. We guarantee that you will be able to create your new eBay stealth account in only a few days or your money back! We are 100% certain that you will be more than happy with your purchase and will offer a 100% money back guarantee with your purchase of our eBook! Suppliers And Wholesale List We show you how to successfully drop ship items and make thousands of dollars a month easily with Amazon. Lifetime Updates Get free lifetime updates of eBay Stealth. This means that you will get a new version of my guide whenever there is an update! Learn to be Fully Anonymous You will learn how to cloak your online presence, not only for eBay but this can be used anywhere else you might go online. Get Back On You will learn how to get back on eBay and Stay On within hours of reading eBay Stealth! I’ll show you how to NEVER be Limited or Suspended again! Verify eBay and PayPal I will show you how to verify your eBay and PayPal accounts the right way without compromising your identity! Avoid Using SSN If you are American, I will show you how to get your PayPal account verified without giving your social security number. Avoid Using PayPal Learn how to avoid using PayPal altogether and save yourself half the hassles! Create Multiple Accounts Safely Learn how to create multiple eBay and PayPal accounts the right way, without linking or requiring constant phone verification. Suppliers and Wholesalers Get access to the suppliers and wholesalers that I use for the exact items I sell on eBay. Sell Without Getting Suspended Learn how to sell whatever you want while minimizing your chances of having those items removed. I’m looking at your VeRO sellers! Stay Under the Radar I give you tips and techniques you can use to stay under the radar – minimizing your chances of getting suspended again. Prevent Account Linking I show you how to prevent your accounts from becoming linked and suspended again! If you decide not to purchase our proven to work eBay stealth system, then you are truly missing out on the most responsive support team, best techniques and most up to date tricks we use on eBay! These stealth techniques need updating constantly… and what does that mean? You need a support team of stealth members and writers to keep you up to date with all the new developments eBay has, and ofcourse keep you under the radar! No other eBook can offer what we offer! We will constantly update our eBook with the newest and most advanced PRO techniques and have members that are willing to help you out every step of the way. But hey, don’t take our word for it, check out what some of our recent buyers of eBay Stealth Pro are raving about! Here is the feedback we have received during the launch of our eBook just a few months ago. If you want your feedback featured below, just email us after you have purchased and we would be glad to add you to our page! We developed eBay Stealth PRO for several reasons. We wanted to have a close knit community in where we can share ideas, keep everyone selling on eBay, and figure out any problems our members are having in creating new stealth accounts. The biggest problem we have seen arise from the so called eBay ebooks are that they don’t work anymore! Why is that you say? Well simply because eBay is changing constantly. And by that we mean, almost every week we’ve had to update our eBook, and sometimes even twice a week to keep up! We don’t like it as much as you that eBay insists on changing the things that they do, but its something we have to deal with to keep in line with their new algorithms and systems. A while back, eBay just required you to have a different IP, get a new address, new name, and clear your cookies right? Well eBay has changed drastically! Try creating a new account with those things cleaned off, we promise you won’t succeed! eBay is implementing vast new changes, for example, now they require all new sellers to call in and answer a few multiple choice questions based on their location and demographics! Heck, most people will have no idea how to answer them as they lied on the sign up page! We have figured out how to successfully get past all of this, and will keep you updated on all the new techniques and tricks we discover as the weeks go by! We know you are more than ready to get started, but to help you get the most out of your eBay stealth accounts we want to assure you will be armed to the teeth! With that said, check out our exclusive bonuses that you will be receiving with the purchase of eBay Stealth! Full Supplier List - Learn where the powersellers and eBay millionaires get their wares! Whether you are looking to wholesale on a mass scale, or looking to dropship all of your goods, we have it all covered inside! eBay PRO Seller - Learn how to sell brand name items like the powersellers without getting limited! Most sellers who start selling brand name products such as Adidas and Xbox 360 tend to get limited after only selling a few products! Private Membership - Get exclusive pass to our members email list where we discuss the most frequently asked questions and help each other out to stay safe selling with our stealth accounts! Frequent Updates - Must have updates to eBay Stealth! Will be sent once available directly to you! eBay constantly updates and adds new security features and we will stay ahead of the game and keep you ready when they come out! No worries once you purchase from us! Sign me up! I’m ready to start selling on Amazon again! I want to stop wondering what to do next and get started now! By purchasing this eBook, you agree to the following: I agree that I will be recieving updates to this eBook once they are released completely free of charge. This way, I will have access to all the newest techniques that are available.Everything in the guide is confidential and I will not give the information to anyone else who hasn’t purchased the eBook. Click the button below to get eBayStealth Now! Yes! I Want To Create A Stealth eBay Account Today! We have provided you with the tools and skills to succeed, don’t leave here and miss out on this once in a lifetime opportunity! P.S. We truly believe we have created something priceless for you. This eBook is designed to help you create your own business with ease, and it certainly does achieve that. Don’t waste time searching through the web and forums looking for a way to do what this eBook tells you. You will just be digging yourself in a deeper hole, with less money to afford our eBay Stealth Pro! If you have any issues, comments, or suggestions please email us using the contact page above!